Hydrogen is flammable at concentrations between 4% and 75% in air, which is a very wide range compared to other common fuels. (See the Flammability Range chart for hydrogen and other common fuels). The hydrogen concentration could easily reach the lower flammability limit (4%) if there were a leak in a confined space with no ventilation. An outdoor leak would simply rise quickly and diffuse. Hydrogen burns with a pale blue flame that is almost invisible during daylight hours, so fires are almost impossible to see with the naked eye. Hydrogen fires have low radiant heat, so you can't sense the presence of a flame until you are very close to it (or even in it). Combustion can't occur in a tank that contains only hydrogen. Oxygen (or air) and an ignition source are required for combustion to occur. Hydrogen burns with a pale blue flame that is nearly invisible in daylight. The flame may appear yellow if there are impurities in the air like dust or sodium. A pure hydrogen flame will not produce smoke. 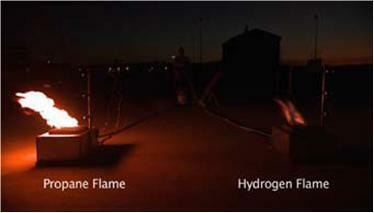 Hydrogen flames have low radiant heat. Unlike a hydrocarbon fire, you may not feel any heat until you are very close to the flame. 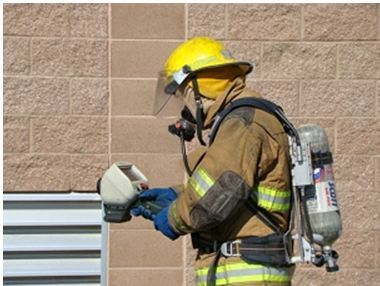 Because of these properties, use a portable flame detector, such as a thermal imaging camera, when possible. If flame detection equipment is not available, listen for venting hydrogen and watch for thermal waves. Note that vent stacks are standard in storage facilities, and the ignition of venting gaseous hydrogen is common. Systems are designed to do this safely. 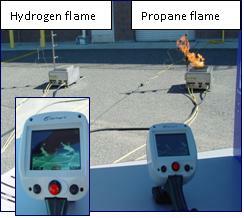 Flame detectors may be installed in storage facilities and fueling stations. Listen and watch for audible or visual alarms.